The third ward presents part of the infrastructure of railways. The visitors can see tools of rail maintenance, rails and sign system. There are upper- and lower cable systems of the BKVT and BSZKRT. 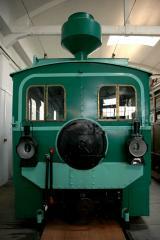 The first HÉV (Local Train) transport began with steam engines in 1888 that were succeeded by electric train in 1914. The shed that functions as a museum from 1992 was built in 1914. The first ward introduces rail transportation in Budapest from the first opening of the horse trains in 1866 until the metros. Several photos and drawings show the predecessors of BKV. There are photos of almost all vehicles that were operated in Budapest. Picture of the 120-year-old HÉV in Lőrinc is also shown. The second ward presents a review of railways of 30 Hungarian towns. The number of photos and graphs is almost 700. We show railway lines of Temesvár, Arad, Nagyvárad, Brassó, Kolozsvár, Nagyszeben, Eszék, Zágráb, Fiume, Szeged, Debrecen, Miskolc, Nyíregyháza, Szombathely, Pozsony, Kassa and several smaller villages.